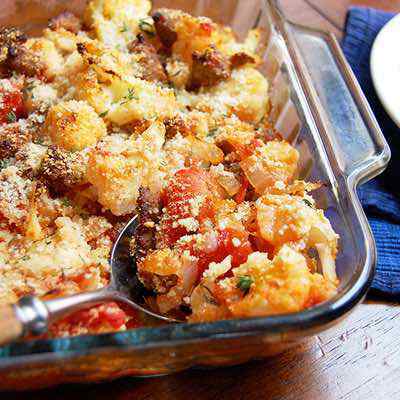 Casseroles are wonderfully versatile dishes. You can make them up for breakfast, lunch, or dinner, and while they can be specialized for particular meals, they’re typically nutritious enough that any recipe can really be eaten any time of day. 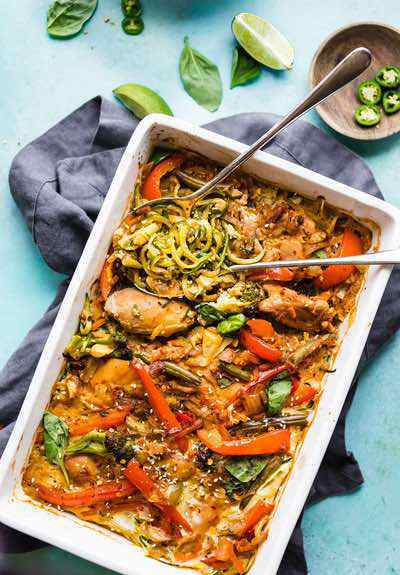 Paleo casseroles are easy, because they get their flavors and richness from plenty of meat and vegetables, and ingredients like coconut milk and nutritional yeast are always on hand to make things extra creamy when it’s called for. So check these recipes out and get into the kitchen! This is probably my favorite paleo casserole of all-time! It is really, really easy to make, low carb and my whole family is obsessed with it. Try this quick and soul-satisfying paleo-friendly green bean casserole to eat as a side dish or as a tasty meal. 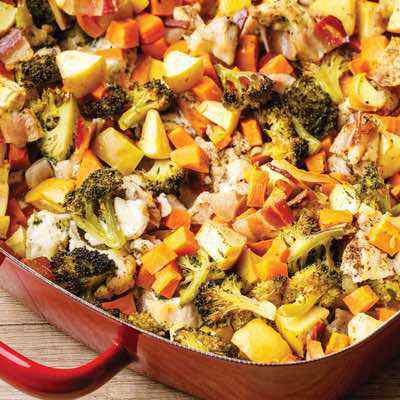 Next time your sweet cravings hit, try this healthy sweet potato casserole. 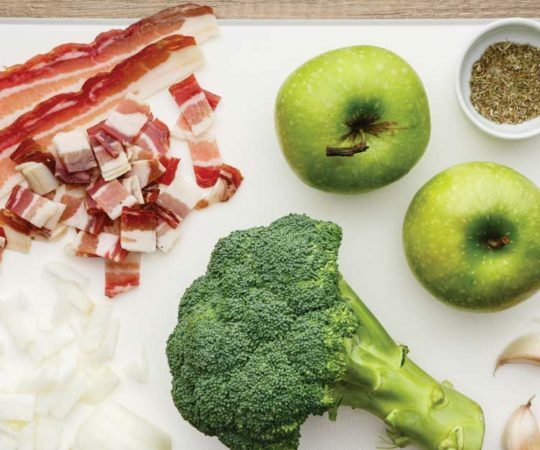 It is completely paleo-friendly and won’t bust your diet progress. 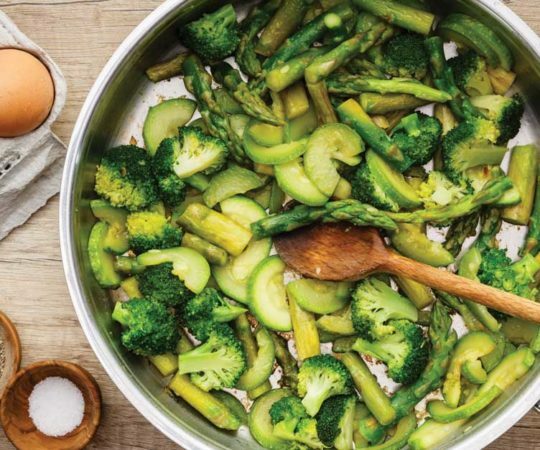 Green vegetables, especially cruciferous veggies like broccoli, are essential for a healthy, balanced diet. 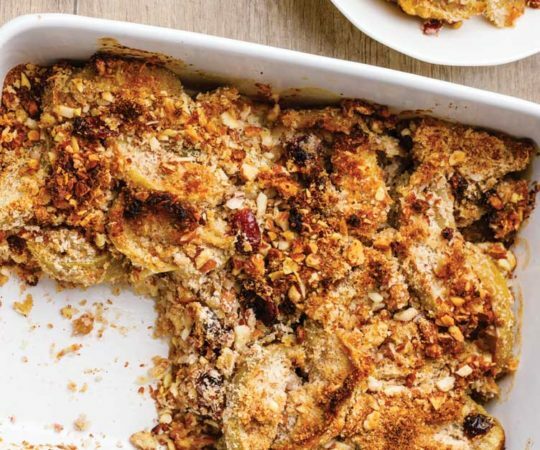 You’re going to love this casserole from the very first bite (and it is packed with nutritious fiber). 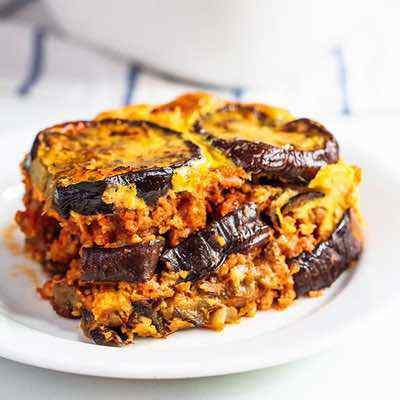 This paleo eggplant beef casserole is one casserole recipe that is both easy to make and easy on the budget. Talk about a win-win. A sweet paleo breakfast casserole that is also completely vegan. 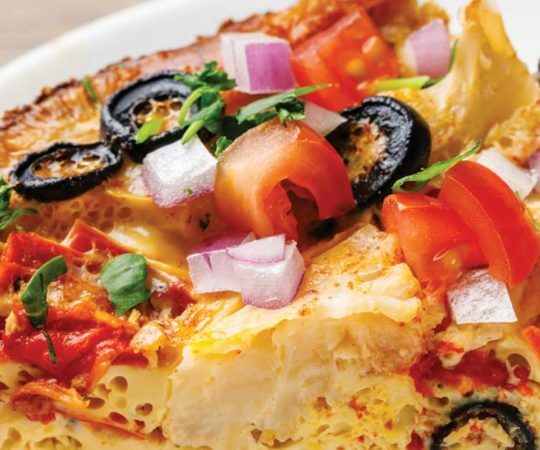 Cook this make-ahead breakfast casserole and have breakfast ready for the week! A great meal prep hack when your mornings are busy. Going paleo means giving up your dairy cravings, or does it? 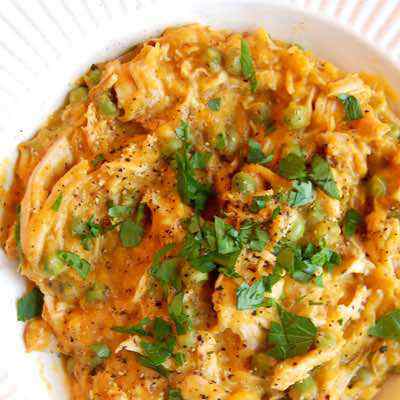 Try this recipe for a rich and creamy, and dairy free, cheesy paleo chicken casserole for dinner. 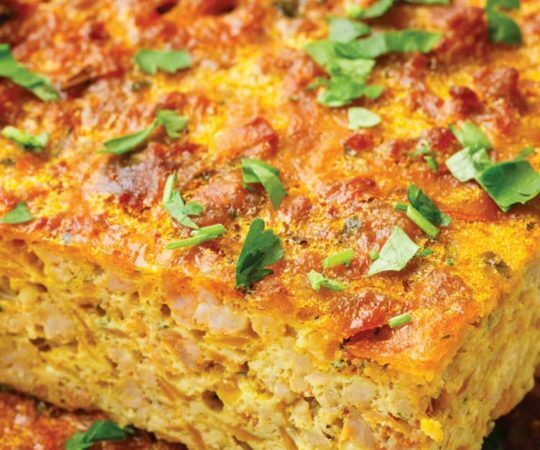 This is my go-to paleo casserole recipe when I am looking for a hearty, eggless breakfast. 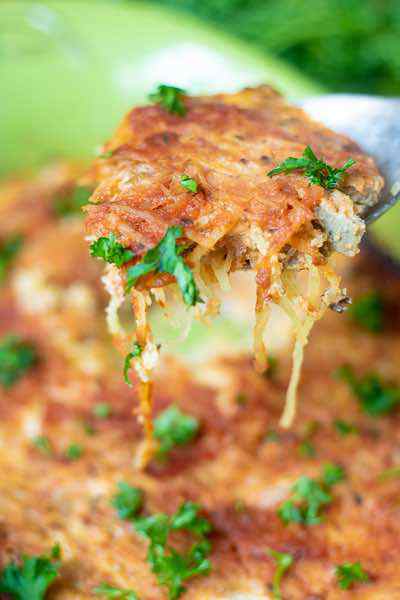 Whether it’s a cold winter night or a hot summer day, this easy tuna casserole will taste just as delicious during any time of the year. 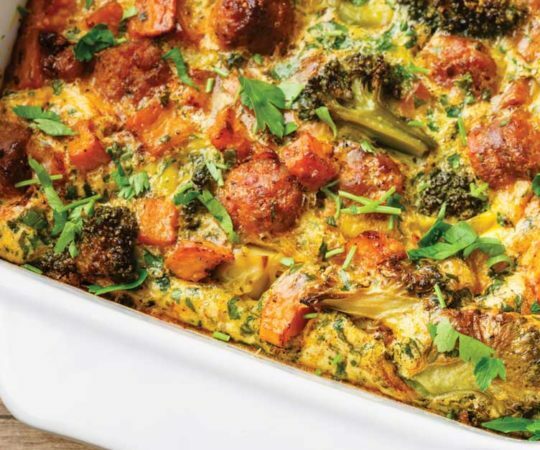 Sausage and cauliflower florets are combined with other paleo friendly ingredients to make a tasty and comforting casserole dish that’s high in protein and packed with veggies. 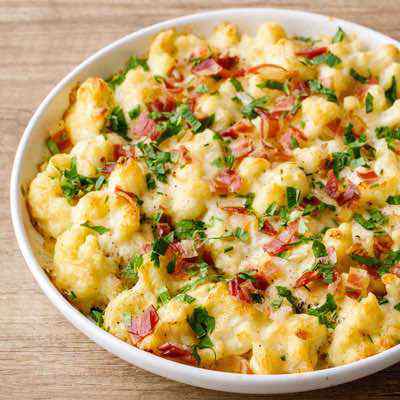 This is a great casserole to make ahead and freeze until you’re ready to eat it. It’s nourishing and filling with lean ground turkey, zucchini, onion, bell pepper, tomato, and seasonings like tarragon and oregano. It’s doused in an almond-coconut meal sauce with olive oil and ground pepper. Yum! This casserole has all the flavors of a fantastic enchilada, with chili powder, garlic, oregano, and tomatoes. Magically, sweet potatoes become the layering that takes the place of tortillas, so you still get the layered effect without needing to mess with any tortilla substitutes. 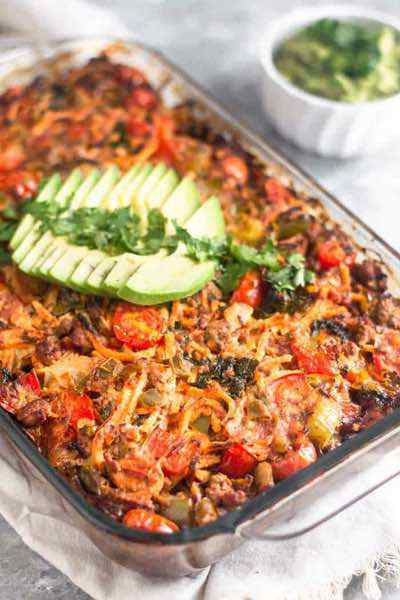 This meaty dish is perfect for just about any meal, as it’s full of vegetables from the spaghetti squash and tomatoes, protein from lean ground beef, and plenty of spinach greens. Really, it has everything you want in a powerful breakfast, lunch, or dinner. This casserole is filled with flavors of the sea, hearty potatoes, and shaved Brussels sprouts. The mix of textures here is phenomenal, and the honey mustard dressing and balsamic vinegar add a particularly savory punch that will leave you going back for more. Really, I don’t need to say any more beyond the title of this recipe. But I will. Because it’s one of my favorite casseroles, and I can’t help it. 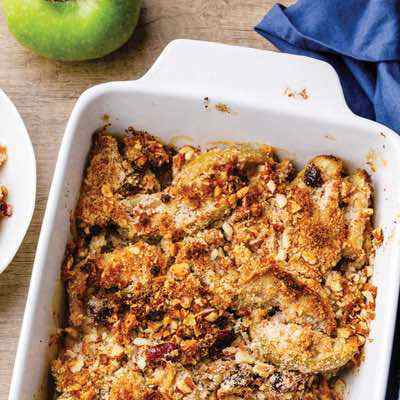 The vanilla-spice flavors of this dish are absolutely fantastic, and the crunchy streusel topping is brilliant with hazelnuts instead of the usual pecans. You have to try it. I love layers. Who doesn’t? They add texture and flavor variation to each bite, and are fun to make. Especially when one of the layers is bacon, and another is a sweet and savory cauliflower, coconut milk, and sweet potato puree. And that’s only half of the layers! This recipe is for a paleo lasagna made with butternut squash “noodles” (so good) and a paleo, dairy-free “cheese” made from ghee or tallow, arrowroot, almond milk, eggs, and plenty of herbs and seasonings. While I don’t necessarily think it’s safe to eat these while driving to work, I give the recipe major props for innovation and for creating a super-portable breakfast casserole that’s filling and nutritious, and full of delicious flavors of sausage, bacon fat, and sweet potato. Just look at that topping, people. LOOK AT IT. All with shredded coconut, chopped pecans, almond flour, butter, honey, and spices. The butternut squash itself is a perfect stand-in for sweet potatoes with its buttery flavor and eggs for stability and protein. 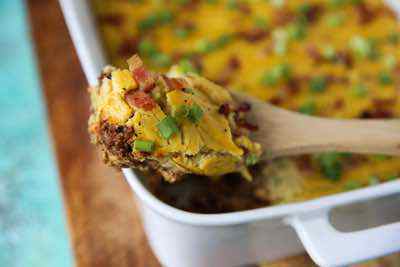 The beautiful thing about these breakfast casseroles is that while they’re filled with “breakfast foods” like sausage and eggs, they’re perfectly healthy and acceptable for any meal of the day. So feel free to chow down on this unbelievable spaghetti squash and sausage goodness all day long. 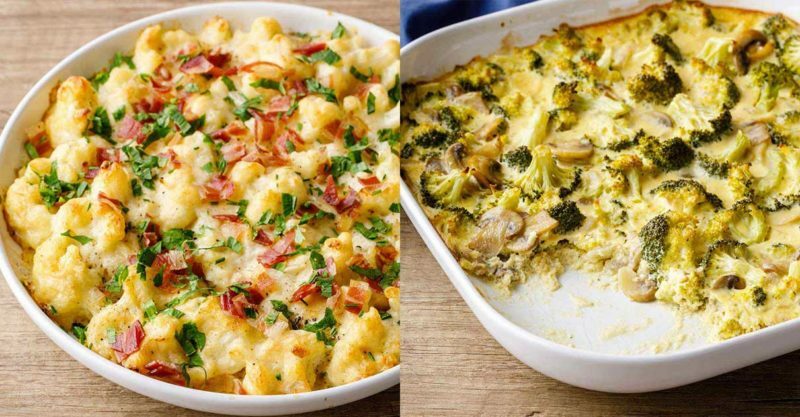 This casserole can be made with or without cheese, as demonstrated by the half-and-half pictures. It’s delicious either way, with layers of vegetables and soft sweet potato. You could always substitute homemade bone broth for the vegetable broth for added nutrition. 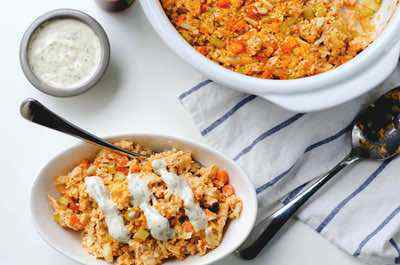 Over cauliflower rice, this casserole makes the perfect full meal with creamy, spicy flavors of cinnamon, allspice, and cardamom, with sweet bites of raisins. You’ll get plenty of protein from the lamb, and a healthy serving of vegetables from the eggplants. If you avoid white potatoes, but you’d rather not have your pie with sweet potatoes (while delicious, they admittedly do change the flavor), try this rutabaga shepherd’s pie with a seasoned and creamy rutabaga layer piled on top of balsamic-infused meat. I’m a huge fan of sweet potato casserole, and I love this version that includes orange juice, coconut butter, and grated ginger. So delicious and especially unique. Maple syrup gives the topping a bit of sweetness, while cinnamon adds the right amount of warm spice. 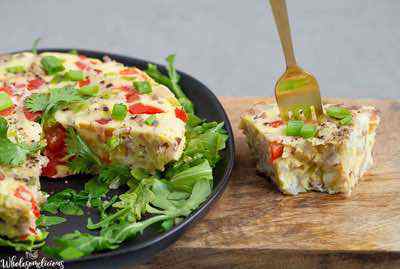 If you like frittatas, you’ll love this breakfast casserole, which is packed with eggs, homemade sausage, bacon, sweet potatoes, onions, bell peppers, and the creamy, healthy-fat goodness of coconut milk. The seasonings in this recipe are wild and amazing. This casserole is packed to the top with Mexican flavors, and it’s spicy! Cut back on the cayenne if you can’t handle the heat. My favorite part is the homemade guacamole on top of the egg layer, which is beautiful and takes this bake right to breakfast land. This recipe couldn’t really be any easier. You just need eggs, bacon, and frozen spinach. That’s it! The bacon does all the work for you, infusing its flavors throughout, and the eggs are the binding that holds everything together. You should know that this shepherd’s pie can be made with a sweet potato topping instead of white potatoes, if you wish. The important part is the deliciously saucy, savory filling of beef, onions, zucchini, kale, diced tomatoes, basil, and more. Believe it or not, there is no dairy in this sauce. I guess you can believe that, because you know paleo eaters get pretty creative, right? 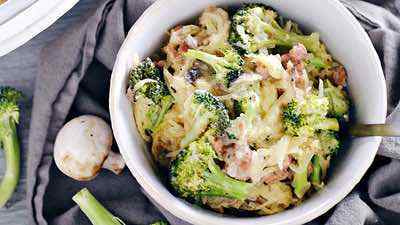 Try pecans with scallions, a bit of honey, coconut milk, nutmeg, and thyme, slathered over steamed broccoli. So good. In another Thanksgiving classic, we’re replacing the typical dairy-and-grain ingredients with paleo alternatives. 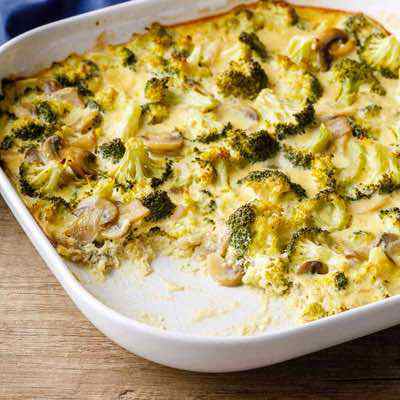 The creaminess in this casserole comes from cashews, while almond meal helps out with the texture of the topping and gobs of garlic add wonderful flavor. This casserole is made with Thai flavors and inspired ingredients like lemongrass, curry, and coconut milk, but it cooks up in a single pot and is super easy. While it’s a casserole in name, be aware that it’s made on the stove, and not in the oven. Here’s another take on paleo green bean casserole, and this one’s free of nuts if you need to make it nut-free. Red onion, garlic, and red pepper flakes ensure maximum flavor, while nutritional yeast and parsnips add a savory creaminess that can’t be beat. Because summer squash is so prolific, by midsummer, many gardeners are scrambling to find ways to use it up. 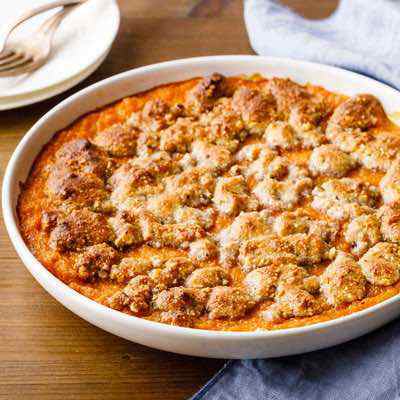 Here’s an idea for you: a casserole with a crumbly almond flour topping and a happy-fat buttery flavor with ground pepper, garlic, and onion. 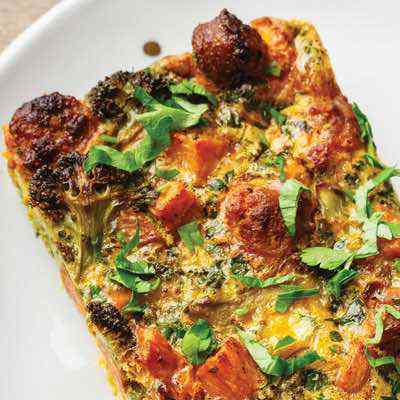 This breakfast hash casserole is colorful and tasty with butternut squash or sweet potatoes, chopped kale, red cabbage, cauliflower, broccoli, onions, zucchini, and herbs. So many vegetables, you won’t even miss the meat in your breakfast this time around. I’ve been pretty much obsessed with pineapple in savory dishes for months now, so I’m pretty excited about this recipe. You will be too, when you see all that spaghetti squash, ham, onion, pineapple, pizza goodness without any cheese or crust. Check to make sure your marinara is paleo-friendly, and then get cooking, because you want this in your mouth as soon as possible. With eggplant, meatballs, and marinara, this dish is bursting with Italian flavors without any grains or dairy. 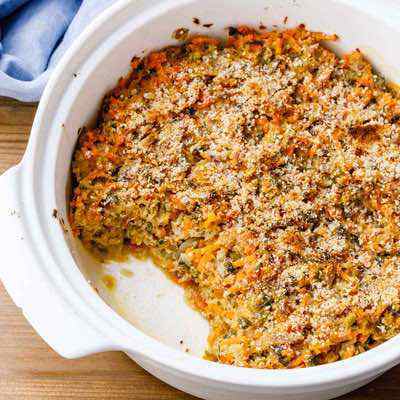 This casserole is comfort food to the max, thanks to the flavors of chicken broth and the crispy, golden brown texture of this casserole post-baking-session. You can’t go wrong with Italian flavors like parsley and garlic, so just give it a try. This casserole is fantastically loaded with butter, coconut milk, macadamia nut cookie coconut butter, macadamia nuts, eggs, green beans, onions, mushrooms, and lots and lots of love. 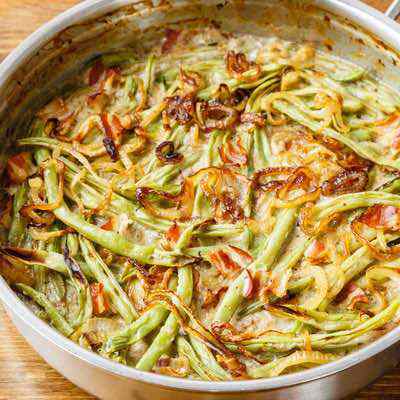 What a unique take on the traditional green bean casserole of your non-paleo past. 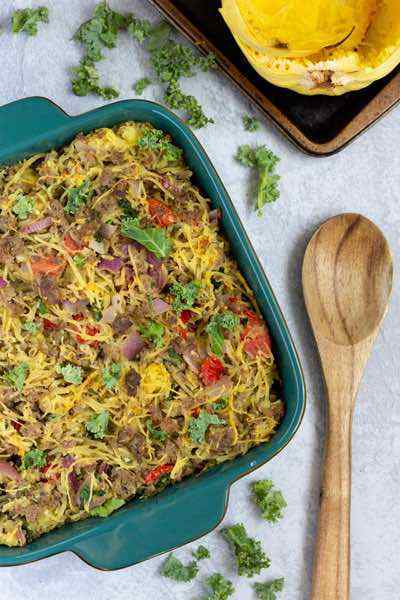 With Thai flavors from fish sauce, coconut aminos, Thai red curry paste, and bird’s eye chilies, this recipe is a kick in the pants full of spaghetti squash and protein-rich spiced ground beef. Mushrooms add an earthy tone, while eggs keep it all together. 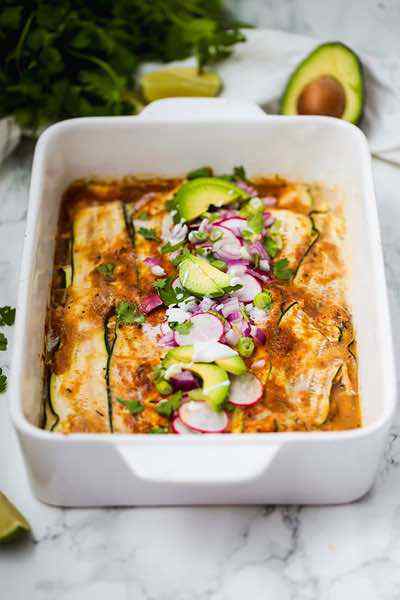 When it all comes down to it, a good enchilada is all about the fillings: chicken, vegetables, and seasonings like chili powder, cumin, and garlic. 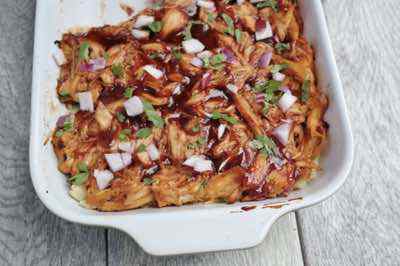 This enchilada casserole has no cheese or tortillas, but it’s full of chicken, red onions, avocado, and mixed greens.